They say you’re not a real LEGO Space builder until you’ve built a SHIP — a “Significantly Huge Investment in Parts” — that’s at least 100 studs long. As tempting as it was to take on that challenge, I was having so much fun with my little microscale fleet that I decided I wanted to stay within a size that was a reasonable addition to the carrier, cruiser, destroyer, and other little ships I’d built before BrickCon. Spurred by a rival fleet Mike Yoder built, I set out to add a battleship. Thus was born UES Vanguard, the flagship of the United Earth Federation interstellar fleet. Despite limiting myself to 55-60 studs, I still struggled with the engineering problems of creating something that wasn’t just built from bricks and slopes stacked on top of each other — something I know regular LEGO Space builders solved years ago. 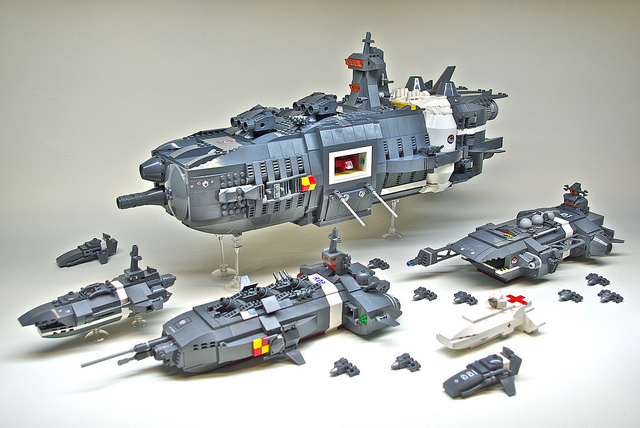 By the end, Vanguard was basically built as a “normal” LEGO (SYSTEM) skin enclosing a Technic latticework. That makes it strong enough, though, that I can hold it with one hand near the back and swoosh it around the living room. Sweet! See more photos in the photoset on Flickr.